Today, users of the beta version 6.0 can start updating to the final version 6.0 using the build-in update mechanism. 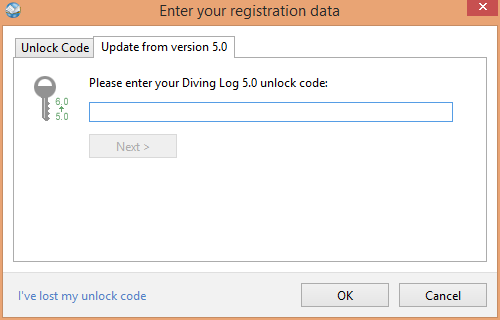 After you’ve installed the latest update, you will see a dialog where you can enter your 5.0 unlock code and proceed with the update. If you’ve bought version 5.0 on June 1st 2014 or later, you can update for free and receive automatically a version 6.0 unlock code. If you bought it earlier, you can update for 6.99 €. Some users (e.g. translators) can also update for free, so please make sure you click on “Next >” to see if you’re eligible for a free update. The official launch will be July 1st. This preliminary launch is for testing the update mechanism. 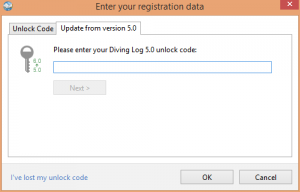 This entry was posted on Thursday, June 25th, 2015 at 10:51 pm and is filed under Diving Log 6.0. You can follow any responses to this entry through the RSS 2.0 feed. Both comments and pings are currently closed. Fantastic congratulations and thank you very much. Looking forward to using 6.0 on a consistent basis. Great work Sven, thanks for all your help… the modest cost of the upgrade represents great value for money.